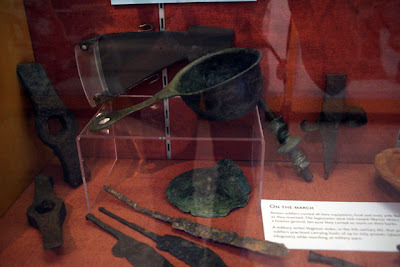 Here's a couple of photos (well three to be exact) that I've been meaning to add to the blog for some time. 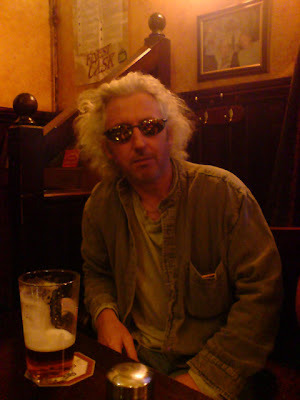 Firstly there's one of Loz looking like a bit of a rock star, be it an ageing one but a rock star none the less. I asked Mel to take a look at the photo (because he knows a thing or two about this sort of thing) and tell me if he thought Loz did in fact look like a rock star. He took a look at the picture, paused for a few moments then said; "Yes, Status Quo". I'm not sure that's a good or a bad thing. 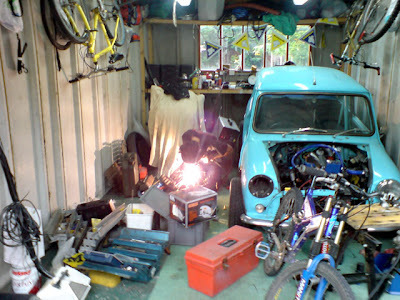 The next picture is of Gaz's garage.... a bit rock and roll in its own right. It's a man's garage, a garage full of boys toys, a garage equipt to put a spaceship on the moon. Or on the day I took the photo, a garage equipt to make emergency repairs to my boat trailer. 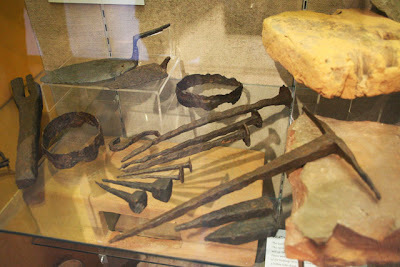 And last but by no means least I give you a preview of Bob's Turner Prize entry. Fuelled by alcohol, I lot of thought and reasoning went into this latest creation. It's titled "Tobacco Tree" and if you look closely the reason becomes obvious. The piece of art is a thought provoking masterpiece touching on several key political issues, not least the escalating growth rate of taxes on tobacco and the controversial decision to ban smoking from public places. 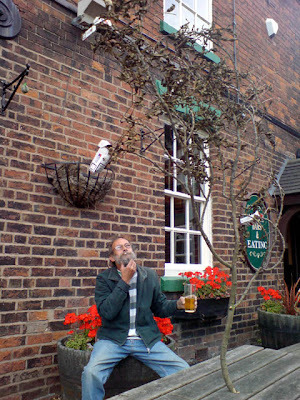 Bob prides himself on using biodegradable items for his artwork. This years winner of the Turner Prize will be revealed on the 3rd December and I'd like to wish Bob the very best of luck in the competition. Matt the croaky frog: Ohhhhh I feel sooooo bad. What time is it? Matt the croaky frog: Ohhhhh I was sooooo drunk last night (then a brief croak about wine, beer, spirits and vintage port). Me: Yes well very good. Now sort yourself out, we're going for a jangle (or words to that effect). 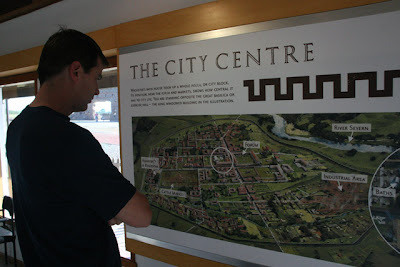 Eventually it was decided we should go and see a pile of old rubble in the form of what was once the fourth largest town in Roman Britain. 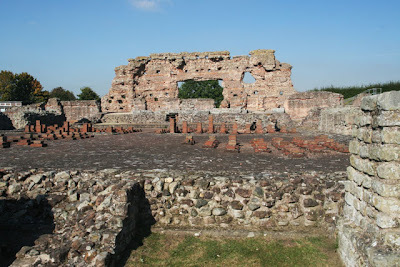 Apparently (although our mate Archaeology Pete would disagree) Wroxeter was nicked off the Cornovii by the Romans and subsequently renamed Viroconium Cornoviorum. 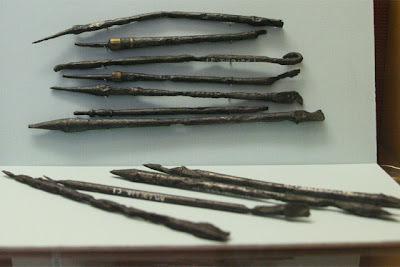 It started out as a legionary fortress and later developed into a thriving city. 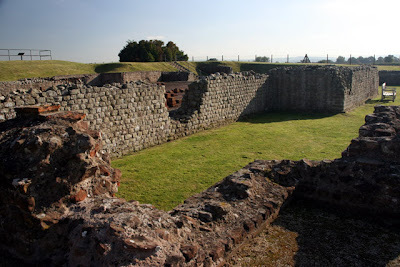 Today most of the city is buried deep within the soil but the Baths have been extensively excavated to reveal some fascinating ruins. 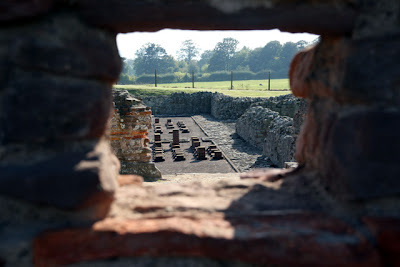 It's also worth noting that there's an award winning vineyard at Wroxeter where you can take a tour and/or buy red and white wines...... Of all the rotten luck!!! 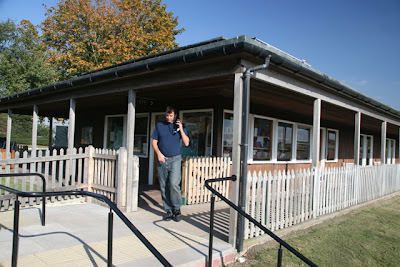 Matt at the visitors centre. 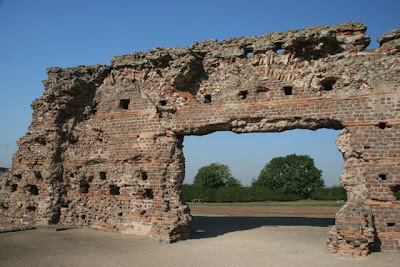 What was once the Basilica. Bathers could exercise here before entering the baths' suite. If you look closely towards both edges of the picture you can see the circular footings where great pillars once stood within the Basilica. 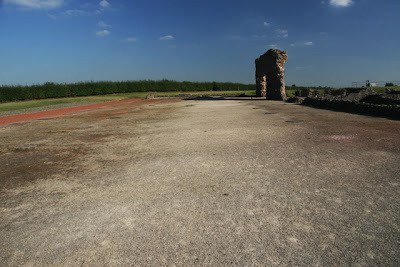 At the top of the picture and in the photo below you can see the only remaining piece of the Basilica wall. 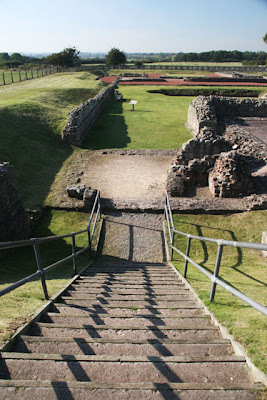 The entrance in the middle led into the baths. 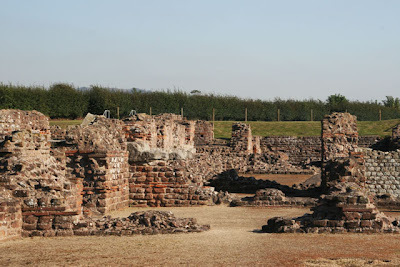 The main heated bath rooms showing the remains of the tile pillars forming part of the hypocaust. 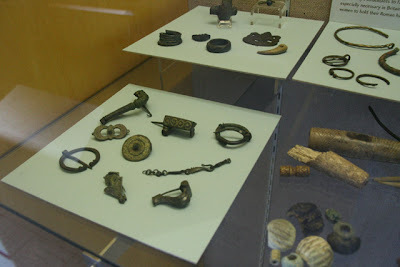 Below are a few photos of some of the objects in the museum that have been found at Wroxeter. 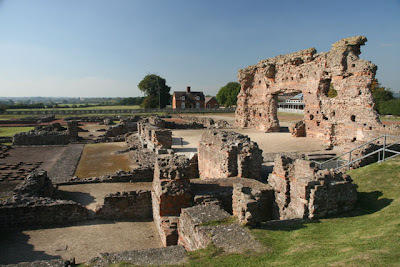 Wroxeter is located 5 miles south east of Shrewsbury on the excellent biking road the B4380, which as well as having one lovely bend after another also has some gorgeous views of the rolling countryside. 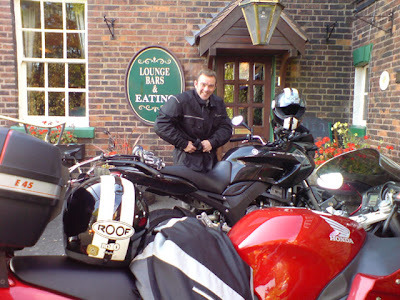 At the end of our jangle and following tradition we frequented the local pub for a pint where we bumped into Gaz, who unbeknown to us had spent his Friday at Mallory park doing a track day. So there we were, Matt and I all relaxed and chilled from our cultural jangle and Gaz on a high no amount of drugs could get you too. 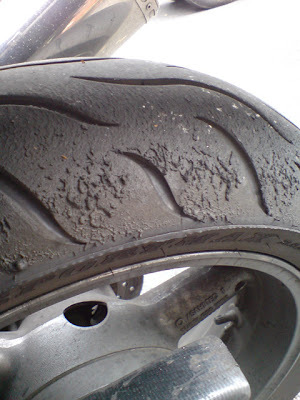 The left hand side of Gareth's rear tyre. Dean's spanking new Yamaha R1. Neil just about to take Matt's TDM out for a test flight. After a week of “I’m so excited” texts to each other, a pair of childish schoolboys met up for a pre-jangle beer on Thursday night. The following morning and meeting at Neil’s garage, 10am was not such a good idea given cloudy heads and even cloudier skies. The latter of which may well explain a sudden lack of MOT on Winnie. The reason for meeting at Neil’s was to try fix No. 328 on Gaz’s SRAD before we set off………. (how about the full story Gaz ?) Needless to say fix 328 was about as successful as the other 327. 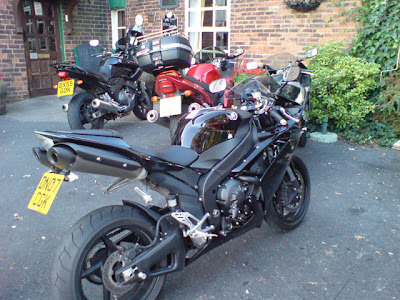 Having been convinced by Loz to load a keg / BBQ of beer on the back of the Yella, “those that can“ set off into the drizzle heading for clear blue skies, via the Ponderosa Café where Loz met with some old friends!! With the tummy rumbles removed we rolled on through Bala, Dolgellau, Twyn and onto base camp at Cader Idris (Loz was pleased to note that supplementary oxygen was not yet necessary, so dutifully “rolled one off”). Caribbean Chicken with Mediterranean vegetables. Waking early next morning we prepare to tackle the untamed easterly ascent of Cader Idris. We're obviously in for the long haul so Loz selects his high capacity colostomy sack. The walk up Cader Idris starts through a woodland area before climbing on large steps to a lake then up the “back wall” to the summit. Having crested and rested Loz decided it was too far to walk back so opted for tomb stoning (Rather aptly named I thought). Time to take five whilst Loz extracts his head from the mountain. Once back at base camp the keg is swiftly recovered from the chiller (stream behind tents) and equally as quickly is emptied, with night and cold drawing in and plenty more “instant idiot tins” to attack, our resident pyromaniac sets about creating the evenings heating before inviting the neighbours round for an evening of fine dining and sophisticated conversation. Suitably stupor’d in the early hours, all tins, bottles and meths consumed, logs burnt out and conversation exhausted we head to bed. A later start on Sunday before heading home via the local to round off an altogether excellent jangle for “Those that can …..!!”. Over the last year Gaz’s Suzuki SRAD 600 has been struggling with the “mother of all bike faults”. In turn it has baffled, bemused and eluded all of us. So during the last few weeks assistance has been obtained in the guise of a local bike breakers Project Bikes Ltd.
Pete of Project bikes did not know me from Adam, when I walked in a month ago and put a ridiculous proposal to him, but now that the fault is cured and all is well I would like to recommend that you all go and spend large quantities of hard earned brass with this “top geezer".